Machining of the pair of axleboxes for the centre coupled wheelset is now complete. A trial fit on the journals of the axle will now take place. 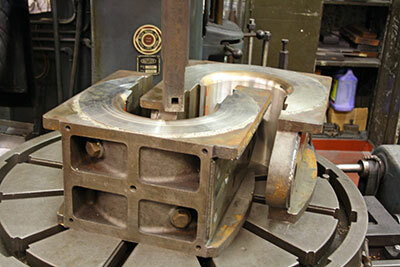 Machining of the axleboxes for the leading and trailing wheelsets will follow on towards completion. This stage of events has meant we can turn our thoughts towards placing the chassis on to its wheels and plans are being formulated. Once the chassis is finally on its wheels and all pronounced satisfactory attention can turn towards the lubrication system and early planning is already underway. Fabrication of the water tanks at Dinas moves towards completion and the F&WHR have been asked if they will arrange shotblasting and initial weather proof painting as an interim measure prior to the full paint treatment process taking place. 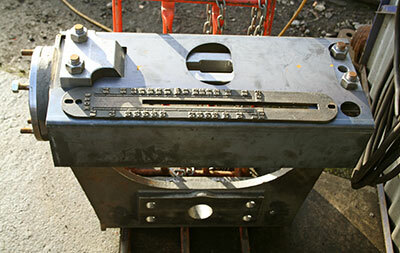 Various support brackets for valves and gauges in the cab have been made as have components of the handbrake mechanism. Most of the components of the driver’s reversing mechanism are complete although not all is shown on the accompanying photo. Vacuum pipework in the driver’s pedestal area is being worked on, this is something of a fiddly and compact location where several controls and their associated pipework will eventually be mounted. Seasonal greetings to all our supportors from 82045 and all the team! Completed axleboxes for the centre coupled wheelset. Main section of the driver’s reversing mechanism. 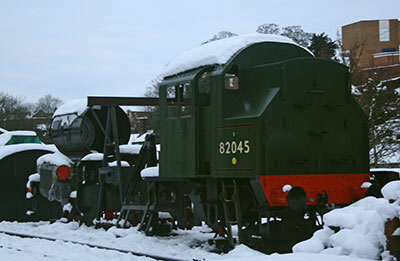 82045 in the snow at Bridgnorth, 13th December. Photos: Tony Massau. Well, it hasn’t got light for the past three days, there’s unspeakable, mind-numbing music blaring out in the shops and supermarkets (I loved Roy Wood’s songs when he was with The Move - remember Fire Brigade and Flowers in the Rain? ), gaudy lights everywhere, people coughing, sneezing, looking stressed and miserable…that’s right, it’s the Season of Goodwill again! I’m not sure the Messiah had all this in mind when he was walking the dusty roads of Palestine two thousand years ago, but that’s another debate and not for us here. To be precise, it’s just two days before the Solstice and I can hardly believe that a whole twelve months have gone by since the 2016 missive. As usual, I am writing this at the very nadir of the year, and to be truthful I could have done with another month, after which I’ve got a feeling I could have told you something that would really banish the winter bleakness from your hearts. As it is, I’m afraid you will have to contain yourselves until January. 2017 has been a strange year, with so much going on behind the scenes to move 82045 towards completion and yet relatively little to show for it: “frustration” is perhaps the best word to use. 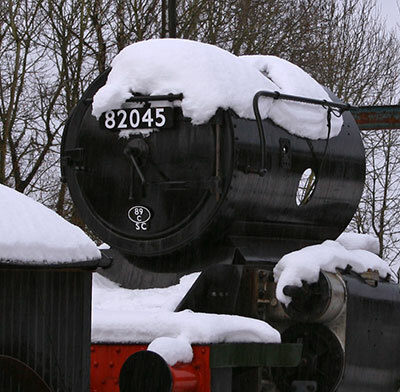 As ever, our engineering team remains the envy of many in the steam railway industry, and yet there is only so much that can be achieved if the overall infrastructure is found wanting: the experience of our friends on the “Patriot” project illustrates some of the problems that can face us when enthusiasm and love come face to face with the hard nose of business. I am keeping a keen eye on expenditure and will give due warning if I have any concerns about the cash flow situation: although the strategic position looks sound, that isn’t a lot of help in today’s hard climate if your bills outstrip your income, and it’s my job, sometimes in the face of doubts on the part of some of my colleagues, to ensure that there’s nothing to worry about. One thing is for sure: without YOU we’d be nowhere at all. That’s about it for this year. Thanks so much for all your support: we promise to do our utmost to deserve it, in 2018 and beyond. floreamus omnes, floreat optime machina vestra, nil illegitimi carborundum!